Retractable Chisel Tip Highlighters allow easy single-handed operation. No more capping and recapping while using your marker. Quick-drying ink will not smear or leak. Bright neon color adds emphasis to materials. 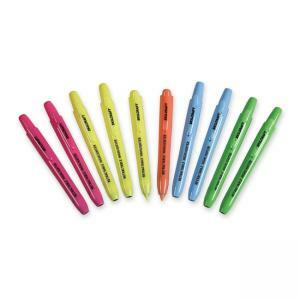 Tip is made of durable polyester that holds its shape during marker use. Chisel tip is designed to allow broad, medium and fine point highlighting. Highlighters have a handy pocket clip for portability. Safety clip protects against pocket leakage. Marker barrels and plungers are made using 50 percent pre-consumer recycled plastic. Highlighters are BPA-free.